JOIN PADDINGTON'S FAMILY AND FRIENDS FOR A 60TH CELEBRATION! Before the party can start, Mr Gruber has given Paddington a list of treasured items that they’ll need… can you help Paddington find them? Every two days a new game is available and you must find a new clue, which will be revealed on a partner website (see detail below) to be able to play the game. You need to enter the clue onto the 60years.paddington.com website and register to play a game. If you complete the game and get the special item your name will be entered into a draw to win a prize. Each universe, game and clue is only live for 2 days. There are four different universes, games and clues for this whole competition. The clue is only be valid for the duration of that associated universe, after which the universe, game and clue will ‘close’ until the next game opens and a new clue revealed. 1.This competition is promoted by Paddington & Co. Ltd. (P&Co. ), C/o Copyrights Group, 4 Pancras Square, Kings Cross, London N1C 4AG UK – the promoter. 3.You must be 18 years or older to enter this competition. 4.There is no entry fee and no purchase necessary to enter this competition. 5.Find the clue on the Paddington or partner social channels or website. Each clue, game and universe will only be open for 43 hours from 06:00hrs BST (UK time). 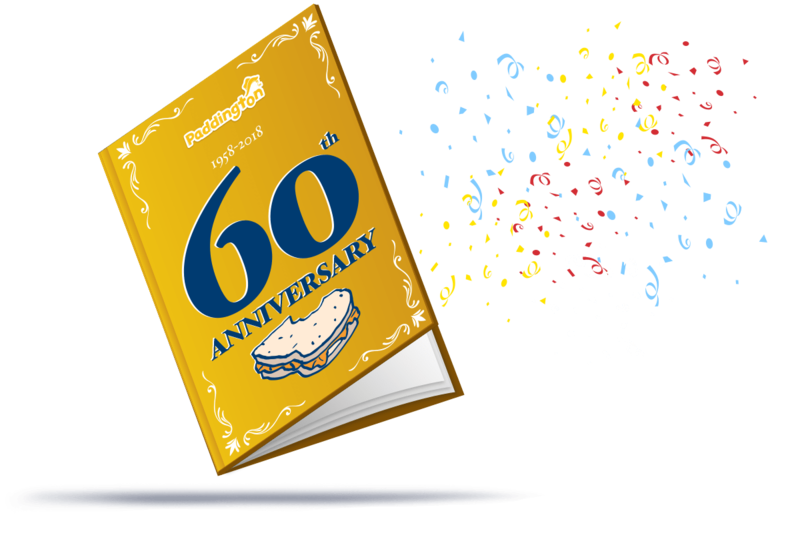 6.Enter the clue and simply play one, or all, of the games available via https://60years.paddington.com website and find one of the special items hidden in each of the four games. You can only find an item once and whilst you can play the game more than once each additional ‘find’ will not increase your entries into the prize draw. How to play ‘Cross the Station’ – To find the special hidden item you must use your arrow keys or touchpad to navigate Paddington through the station avoiding suitcases, people etc. whilst picking up points from the ‘tickets’ and ‘book covers’ within an allocated time of 30 seconds. If you collect at least 16 items the hidden item will be revealed and you will be entered into the prize draw. Saturday 20th – Sunday 21st October: promoted by Yottoy, from the funfair play the ‘Memory’ game and find the special item which is a marmalade sandwich. How to play ‘Memory Game’ – To find the special hidden item you must pair up 8 items within an allocated time of 30 seconds. If you pair at least 8 items the hidden item will be revealed and you will be entered into the prize draw. How to play ‘Paddington over London’ – To find the special hidden item you must use your arrow keys or touchpad to help Paddington fly down the street avoiding pigeons, pavements etc. whilst picking up points from the ‘marmalade jars in the sky’ all within an allocated time of 30 seconds. If you collect at least 90 marmalade jars the hidden item will be revealed and you will be entered into the prize draw. How to play ‘Spot the Difference’ – To find the special hidden item you must find seven difference between the two scenes within an allocated time. If you find all seven differences the hidden item will be revealed and you will be entered into the prize draw. When you register you automatically get entered into the draw x1. When you sign up to the Paddington newsletter, once confirmed by email, you automatically get entered into the draw x 1. For each game played and special item found you will be entered into the prize draw x2. For example, if you only play one game and find the one special item you will only be entered for this instance into the prize draw. If you do not find the special item you will not get additional entries into the draw. If you play all four games, find all four special items but do not sign up to the newsletter you will be entered into the prize draw nine times. 8.Each game will only be available to be played on the dates specified above within the specified time of 06:00 BST UK time) for 43 hours. A user playing any one of these games outside of these dates and times will not be entered into the prize draw during this time. 9.The closing date for all entries is Thursday 25th October 2018 at 11:59pm PST. No entries received after this date will be accepted. 10.The winners of each competition will be selected at random from all correct entries received after the above named closing date. P&Co. shall notify the winner/s no later than Monday 5th November 2018. To facilitate the prizes we will require details from the winners, if they do not provide these within 5 (five) days of notification P&Co. reserve the right to withdraw the prize from the winner and select a replacement winner. Once all winners have accepted their prize all personal details for ALL competition entries will be deleted from the database within 28 days. 11.All entrants are expected to act fairly and in the good spirit of the competition. P&Co. reserves the right to disqualify any entrant who has engaged in unlawful or improper conduct that is designed to jeopardise the fair conduct of the competition or is generally damaging to the reputation of P&Co. and / or their partners, or has otherwise breached these conditions of entry (as determined in P&Co.s sole discretion). 12.Late, illegible, incomplete, defaced or corrupt entries will not be accepted. No responsibility can be accepted for lost or invalid entries for whatever reason and proof of transmission (including, but not limited to, screen grabs) will not be accepted as proof of receipt. Entries must not be sent through agencies or third parties. 13.The personal details supplied by entrants will only be used for the purpose of the competition entered, including fulfilment of the prize by relevant third parties. If opting-in to receiving news about P&Co., minimal information of email address and country will be added to P&Co.’s newsletter database. You can unsubscribe at any time. 1 (one) person will win a personal visit from the Paddington Bear costumed character to your school, club or home (Ts&Cs apply*), plus a copy of ‘A Bear Called Paddington’ book, a Paddington plush, Marmalade Madness boardgame, a Paddington Calendar, a treat bucket, Gift voucher to use in app ‘Paddington Run’ minimum value of $19.99 and a copy of the DVD of the film Paddington2 on DVD / Blu-ray. 15.The prizes are non-refundable, non-transferable and subject to availability. No guarantee is given as to the quality of the prizes and no cash or prize alternatives are available. 16.P&Co. reserve the right in their reasonable discretion to substitute any prize with a prize of equal value without giving notice. 17.The promoter is not responsible for inaccurate prize details supplied to any entrant by any third party connected with this promotion. 18.The prize will be delivered to the winner on [by 30 days after accepting the prize and providing postal address for delivery]. Unless notified otherwise at time of contact prize/s may arrive at the winners home address in one or more packages. P&Co. and our partners in this competition cannot be held responsible for delivery of prizes. It is the winners responsibility to ensure they have given a safe delivery address for their prize/s. 19.In accepting the prize, entrants confirm that they are eligible to do so and eligible to claim any prize(s). The Promoter may require entrants to provide proof that they are eligible to enter the competition. 20.P&Co.s decision as to who has won each competition shall be final. 22.The entry instructions are part of the Terms and Conditions for this competition. 23.By entering the competition, you are agreeing to accept these Terms and Conditions. Any breach of these Terms and Conditions by you will mean that your entry will not be valid, and you will not be allowed to enter this competition. 24.Personal information about entrants will only be shared with the Promoter’s competition partners and with the Promoter’s agents to the extent necessary to manage such entry and participation as an entrant or, where required, to a legal or regulatory body. 25.Under no circumstances will Paddington & Co. be responsible for any loss, damages, costs or expenses arising from or in any way connected with any errors, defects, interruptions, malfunctions or delays in the promotion and / or delivery of the competition or prize. Users are responsible for all costs and expenses relating to participation in the promotion, such as the cost of accessing the internet. 26.The promoter reserves the right to cancel or amend the promotion and these terms and conditions without notice. The promoter’s decision in respect of all matters to do with the promotion will be final and no correspondence will be entered into. 27. Any question concerning the legal interpretation of the rules will be based on American law and the Courts of the United States of America will have exclusive jurisdiction. 29.Except as otherwise required by applicable law the Promoter shall not be liable for the content of any externally linked web sites. 30.If any of the provisions of these Terms are held to be invalid or unenforceable in whole or in part that part shall be severed from the remainder of the provisions and the validity of the other provisions and the remainder of the provision in question shall not be affected.